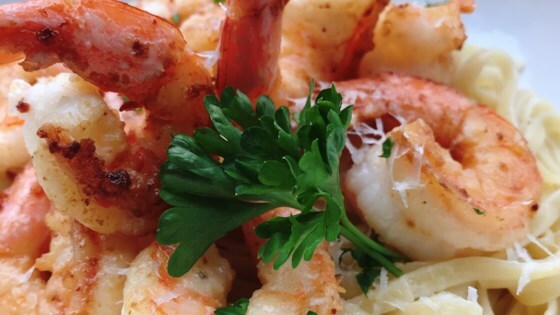 "Dinner doesn't have to take forever -- prove it with this fast and delicious shrimp scampi recipe." Bring a large pot of lightly salted water to a boil. Cook linguine at a boil until tender yet firm to the bite, about 8 minutes. While pasta cooks, melt 2 tablespoons butter in a skillet over medium heat. Add garlic and cook until fragrant and lightly browned, about 1 minute. Add shrimp and cook until tails start curling in, about 2 minutes per side. Add remaining butter, Pinot Grigio, lemon juice, half-and-half, and Parmesan cheese. Stir to incorporate. Drain linguine and divide noodles between 2 bowls. Serve shrimp mixture on top and garnish with parsley. I make this dish often, usually when I'm runny late and need something quick for dinner. I always have pasta in the pantry and shrimp in the freezer. This dish is a snap to make. Absolutely wonderful! We didnt have enough pasta for 4 people, so I also made some Spanish rice to go with it. My whole family loved it. Recipe was awesome! Added some freshly grated mozzarella into the sauce and some red pepper flakes. Perfection. Added more garlic , very yummy! This was creamy and delicious! I used heavy cream instead of half and half and a pinch of oregano instead of parsley which I did not have. I will definitely make this again. Easy and delicious!